"At last, a book that gives anyone concerned about the drug crisis the background information necessary to formulate a new and humane anti-drug abuse agenda. Insightful and thoroughly researched, Pipe Dream Blues brings to light the root causes of this devastating crisis--racism and government complicity with drug traffickers. Pipe Dream Blues is probably the single most important book on this crisis in the last few years." "Pipe Dream Blues vindicates what many have felt but have been unable to document--that racism and the drug problem are inextricably intertwined. 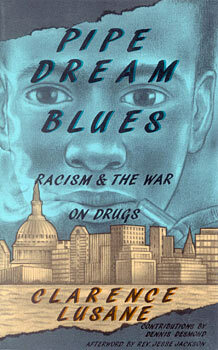 By unraveling the deadly connection between drugs and racism, Pipe Dream Blues inspires confidence that we can understand and fight the drug problem as we rebuild and revitalize our inner cities and other communities." "The repressive Cold War has been replaced by the repressive war on narco-terrorism. Pipe Dream Blues painstakingly exposes how our civil and political rights are threatened by the drug war. Most importantly, it reveals clearly why attacks on civil liberties, such as random drug testing and warrantless searches, must be virorously and unalterably opposed." -- Arthur Kinoy, Professor of Constitutional Law, Rutgers Univ.